Ten Instagram Feeds That Make Me Happy! Are you on Instagram? It serves as a mini-scrapbook of my life. And my phone is always with me so it’s easy to capture the little things in life. The picture above is the first photo I ever took using my Instagram app. It’s a still life of my dresser at the time. I love it because it says a lot about me. 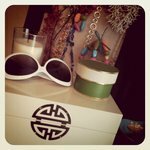 My style is revealed in the sunglasses and jewelry box. It shows that I love the color green and the scent of a good candle. I also made the framed linen piece in the background to hang my jewelry on, so it reminds me that I am creative when I want to be. I just love this picture. You will find an entire community of creative people on Instagram from all parts of the world. Here are ten of my favorites to follow! 1) Christie Brinkley (username: christiebrinkley) – I know. I know. She’s a former supermodel. Someone recommended her feed and I was skeptical too. But she’s a darn good Instagram photographer. Her shots of NYC are STUNNING. She travels (most recently to Africa to take up the cause of saving elephants from harm and exploitation) and takes photos that are truly captivating. She includes her personal life in her feed too. And she draws some wonderful designs in her morning coffee. I haven’t regretted following her at all. She’ll fill your feed with beautiful things. 2) Aerin Lauder (username: aerin): If I could vote Aerin most beautiful Instagram feed, I would. She’s near the top of my list of style icons. The granddaughter of the late cosmetics tycoon, Esteé Lauder and daughter of Ronald Lauder, Aerin recently launched her own line of cosmetics and furniture & accessories for the home. She is also the subject of a gorgeous coffee table book that should be arriving on my doorstep any moment! Her posts tend to be beautiful still life images shot around her home & office. Always exquisitely styled and timeless. 3) The Recapturist (username: recapturist) – “Photography, preservation and micro-history of vintage America”. That what his feed consists of. Gorgeous photos of hotel and restaurant signage from an earlier era. If you like old stuff, you’ll love this feed. 4) BeachBungalow8 (username: beachbungalow8) – She’s a creative girl who loves design, both retro and current. She blogs at http://www.beachbungalow8.blogspot.com. I find stuff on here ALL the time that inspires me. Excellent feed. 5) Plum Collective (username: plumcollective) – If you love mid-20th century design, you will love this feed. All kinds of mid- century furniture, lighting and design on this one. Check it out. 6) Kelly GoLightly (username: kellygolightly) – In her words, it’s a “style guide for the modern-day Audrey Hepburns of the world.” She’s gorgeous, has great style and reeks of vintage style. She travels often and posts great pics from places like Palm Springs, Beverly Hills and Marfa, TX. I swoon over her fashion sense & she knows how to throw a party! 7) Adored Vintage (username: adoredvintage) Like vintage dresses & style? Look no further. You must follow Adored Vintage. Sometimes she posts other things but the focus is vintage dresses. 8) Liljeberg (username: liljeberg) – A Swedish feed that captivates you with letters and numbers, all photographed beautifully. 9) Mrs. Lilien (username: mrslilien) – One of my very favorite feeds! I could honestly ask myself every day, “What would Mrs. Lilien do?” I love her. Her style, her love of old things, her appreciation of a good font; the list goes on. And on. She blogs at www.blog.mrslilen.com. 10) Donald Robertson (username: donalddrawbertson) – Doodling, drawing, painting – he does it all. The creative director for Bobbi Brown Cosmetics has one of my favorite Instagram feeds. I’m wildly inspired by this guy. He frequently shares photos of his wife, kids and home but most of his posts are his stunning artwork, often done with gaffer tape or just a few strokes of a magic marker. He’s unbelievable. Hard for me to go a day without looking at something he posts! I hope you found at least two or three new people to follow after reading these. I hope to make this a regular feature on my blog and I hope you’ll keep checking back to find more new good stuff!